Passion fruit cream puffs | eat. live. travel. write. In just a few short days it will be St Valentine’s Day. For my latest piece for The Ontario Produce Marketing Association I was tasked with developing a recipe using very seasonally appropriate (although definitely not “seasonal” at least here in Canada!) passion fruit for Produce Made Simple. I absolutely LOVE passion fruit despite not eating it much these days. Growing up in Australia, where they were easy to find, the purple, crinkly-skinned fruit held a great deal of fascination for me – I mean, how could something so ugly contain such sweetness? One of my favourite soft drinks was, in fact, Passiona (“pass-ee-oh-na”) though we weren’t allowed to drink it very often – the tropical flavour was delightful to my young palate – it felt so exotic! Nowadays, a fresh passion fruit is a treat (because obviously they don’t grow locally!) but the flavour is something I seek out whenever I can. One of my favourite uses of the flavour is in desserts (though a decent passion fruit yoghurt will go a long way to making me happy in the morning!) 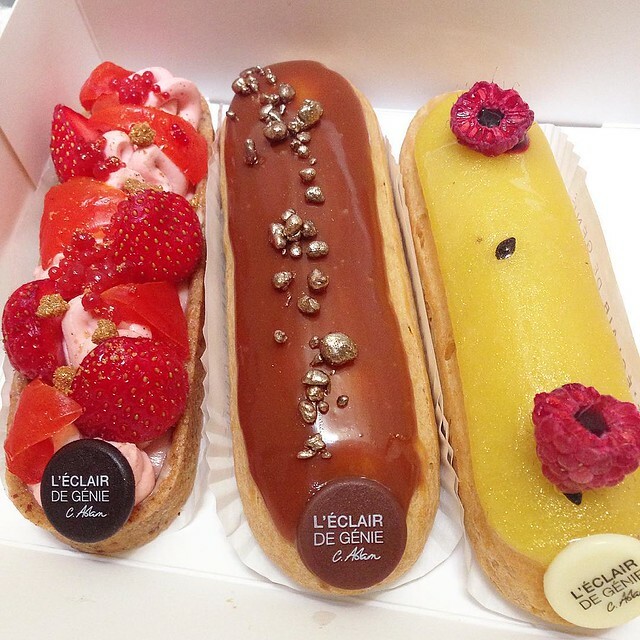 and on my last trip to Paris, I tasted heaven in an éclair. Specifically, a raspberry-passion fruit éclair from L’éclair de génie. For this recipe, I was inspired by that éclair. I knew I wanted to make cream puffs as opposed to éclairs because I think they are much easier to pipe out – in fact you don’t even need a piping bag for puffs – and because basically I want everyone to know how easy it is to make spectacular desserts with choux pastry. Like the look of this? Check out my recipe for passion fruit cream puffs on the Produce Made Simple website. What’s YOUR favourite way to enjoy passion fruit? I love cream puffs as much as I love eclairs! I’ve never tasted passion fruit and now I’m curious to try it. Oh I think you would love this! Right? Jealous of how easy passion fruit is to get a hold of there! I would buy that when I’m home too – blast from the past!